I will share it with all of you today. It's a very easy pasta salad recipe to put together actually. The ingredients can depend on what you have on hand. 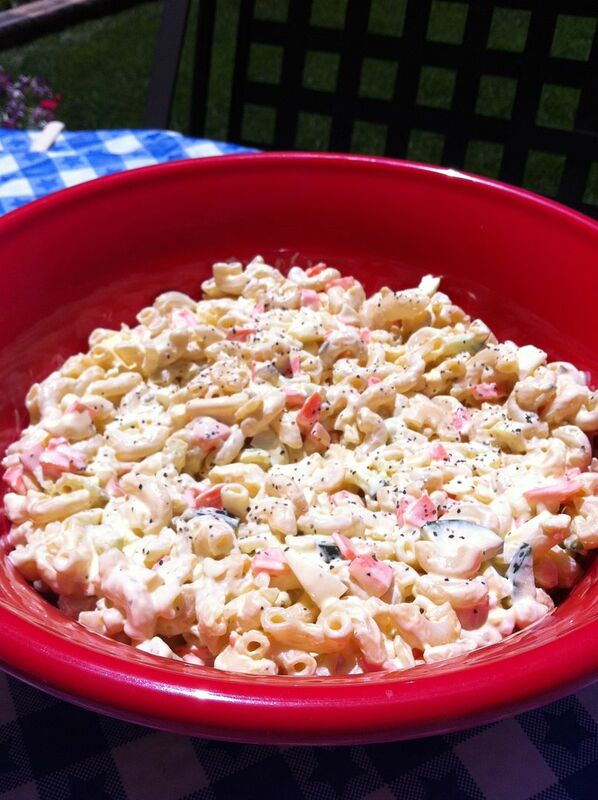 A throw it together kind of macaroni salad perfect for summer BBQ's! if you want a pasta salad that doesn't get dry, overcook your pasta. I'm serious, boil it until it's just this side of mushy. Forget the al dente rule of thumb if you want a creamy pasta salad. leaving you with a sticky, dry salad. Overcook it is all I am saying. Rinse the macaroni in cold water until cool. While the pasta is boiling, in a large bowl, mix all of the other ingredients together. Add the cooled macaroni, and toss until combined. Place in a pretty bowl and serve. This salad goes so well with anything off the BBQ grill! Steaks, dogs, brauts, ribs or chicken. it's the perfect cold side dish to any summer BBQ! I love pasta salad! This looks so good and I like the tip about cooking the pasta a little longer..perfect! I love the looks of that! Gotta' try it! Thanks for sharing this--can't wait to try it! 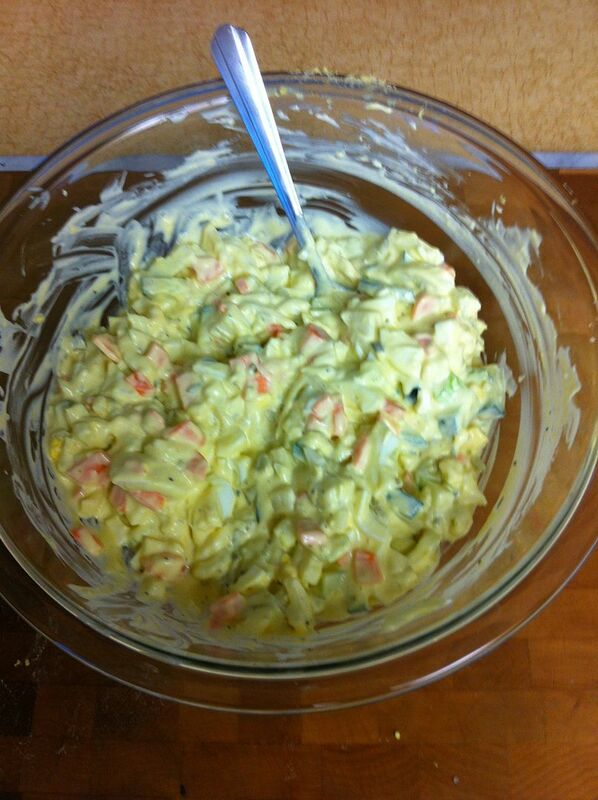 Hi Kathe, this looks like a good egg salad recipe. I saw it on Tried and True recipes. Seriously we are having this for supper. I have all the ingredients. Yay!!! Thank you for sharing, I pinned it. Thank you for sharing at Tuesday Trivia. Check back for Friday's Features. This recipe makes me think of deviled eggs with pasta in them! Love it! Thanks for linking to the In and Out of the Kitchen link party! I am so glad you dropped by! I live in Louisiana where the summers are hot and too humid, this looks so cool and refreshing. Thanks for sharing on Tuesdays With a Twist, pinned to Ahhhh Refreshing board. Ok I keep coming over and over for this salad! LOl...just love it girl, big hug, Lizy...oh this time I came over from Jill's party at kitchen fun with my 3 sons! This is just the best and most yummy looking pasta salad!! Thanks for linking with TTF this week! Yum - this looks perfect for a BBQ! So great and refreshing! Thanks for linking up this week!! 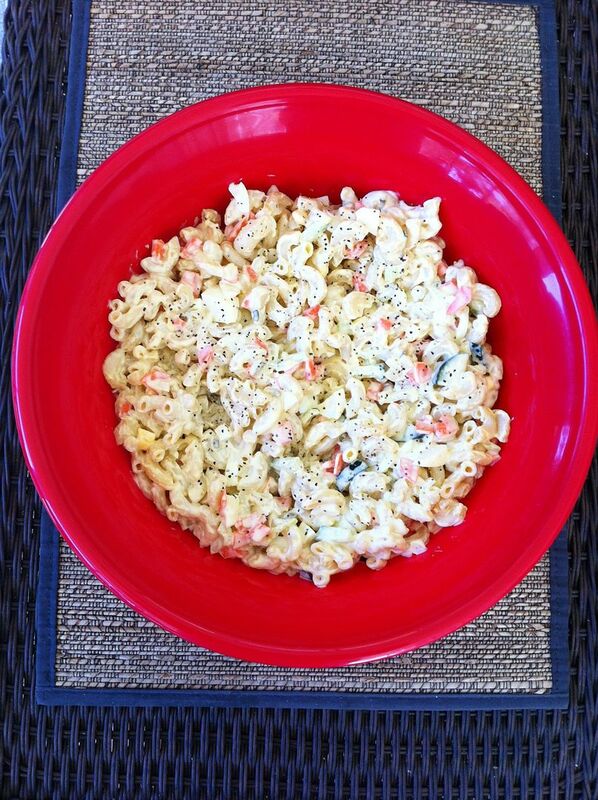 Love macaroni salad. Your recipe sounds delicious! Thanks for sharing at The Gathering Spot this week :) Enjoy the weekend! Summer is the best, food seems to taste so much better, especially salads. Thank you for coming by and sharing this on Fluster Buster's Creative Muster Party. Hi Kathe. This looks yum! Pinned it! Thanks for sharing. Yum! I love those summer salads! Thanks for sharing at Pinworthy Projects. Love this such a classic pasta salad..pinning thanks for sharing it with us on foodie friday. Kathe!! I'm making this on Sunday!! :) It looks delicious! Oh Kathe! I made this this morning to have with dinner and boy is it delicious! I was eating it out of the pot! haha Thanks for such a great recipe! I think this is going to become my holiday macaroni salad!